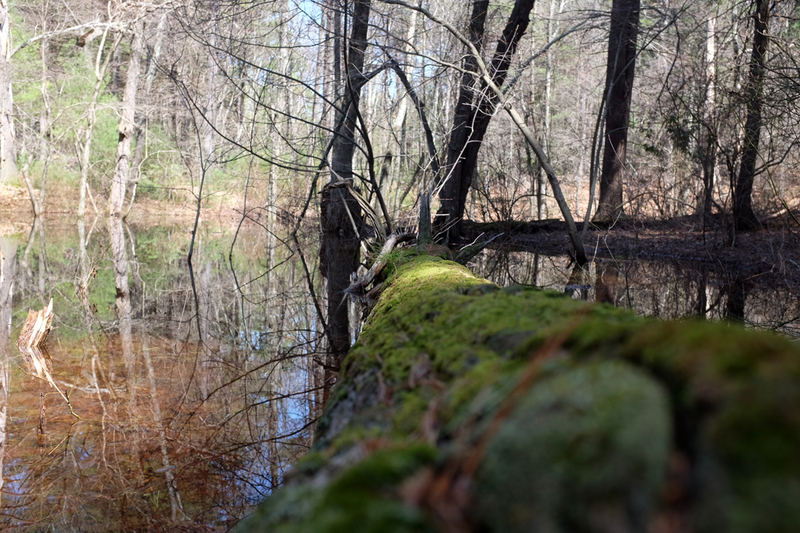 The RainyDayMagazine crew spent the morning exploring a vernal pool at the Mildred Allen Morse Wildlife Sanctuary, part of the Mass Audubon site in Canton (MABA). 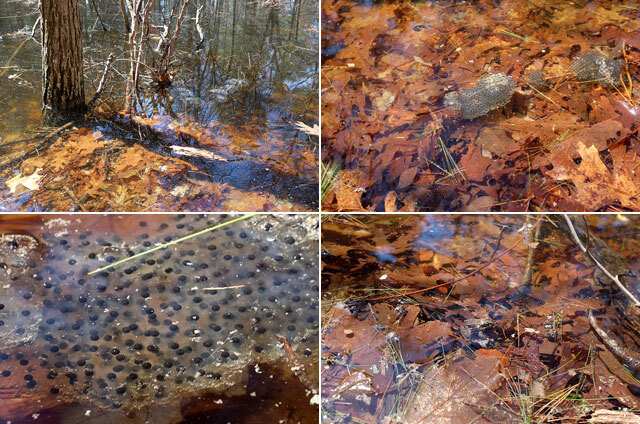 We’d never really had a good look at what’s in a vernal pool, and what we saw was really cool. What’s a vernal pool? It’s a self-contained “temporary” pond that exists normally only during Spring, created from the run-off of the melting Winter snow and the early Spring rains (vernal means “of, in, or appropriate to Spring”). As vernal pools do not have a constant source of water, once what’s in it evaporates, it’s gone until the following Spring. 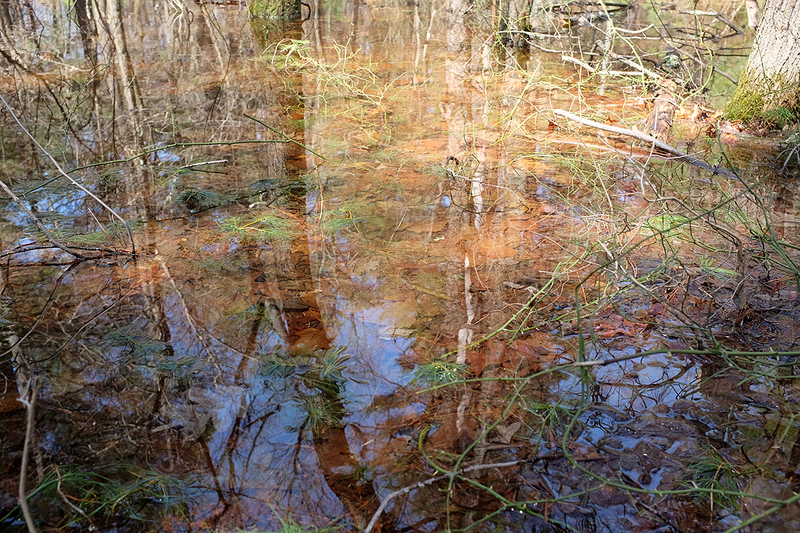 Many vernal pools in the Northeast are covered with ice in the winter months. They contain water for a few months in the spring and early summer. By late summer, a vernal pool is generally (but not always) dry. We went to the one in Canton to get a glimpse of the wildlife that is now inhabiting this temporary pond. The path to the vernal pool was snow-free, but still devoid of vegetation. While the pond may look calm and still, it is actually teeming with life. To see it, we had to hang around a bit, be still, and “see” it. 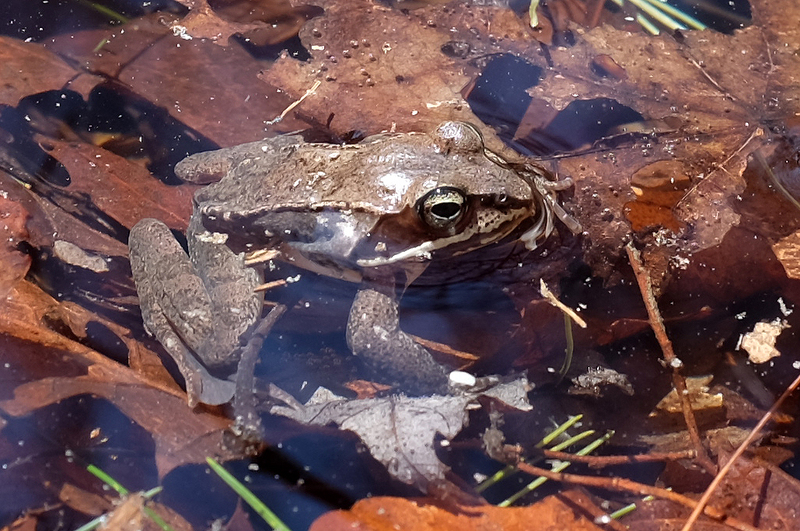 A vernal pool is a safe haven for amphibians (wood frogs, salamanders, etc) and insects as it is typically fish-free. 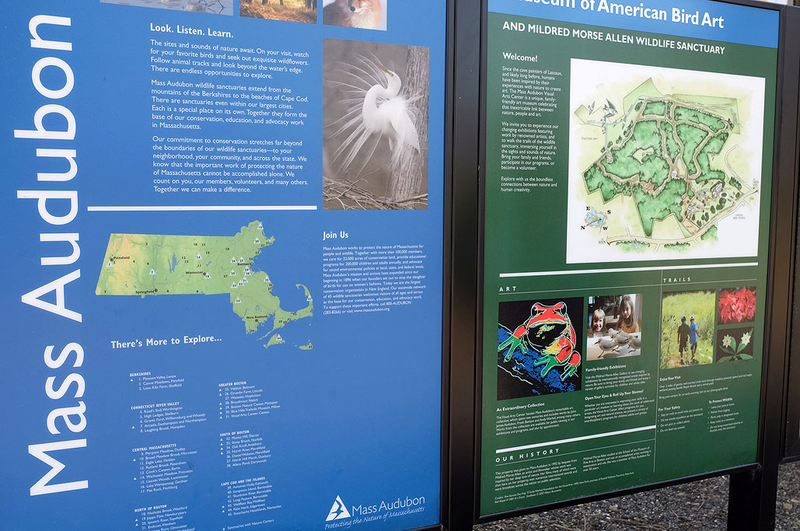 Adults usually live in the woodland itself but lay eggs in vernal pools. Note the white clumps / mass in the the pics below. They are wood frog spawn. Here is a close-up of those floating clumps. The eggs would make for a very tasty snacking if there were fish in the pool. Of course, even without the fish, there are still a lot of other…interested parties…who wouldn’t mind a tasty treat. Many of the amphibians that breed only in vernal pools spend most of their lives in the uplands within a few hundred feet of the water. They lay the eggs when the conditions are right in the Spring. The eggs hatch in the water after a few weeks. The juveniles feed and grow for a few month, then leave the pool to spend the rest of their time away from the pool. The cycle repeats when the adults return the following spring to breed. Wood frogs are interesting because they are more cold-tolerant than their amphibian cousins, enabling them to hibernate close to the surface in soil and leaf clutter. Their body chemistry allow them to withstand multiple freeze/thaw events during the winter. When it gets too cold, both the breathing and heart come to a stop. A special antifreeze produced by the wood frogs prevents ice from forming within their cells. When the temperature rises in Spring, the frogs “defrost” and begin to feed and mate. Wood frogs are one of the first frogs to begin the breeding season. The vernal pool at MABA is now at the start of that breeding cycle. The eggs have been laid and a new generation of will be hatching soon. Those interested in visiting the pool should stop by soon as the water’s edge is still easily accessible since much of the vegetation has not yet started their growth. Visitors should wear boots (not sneakers) and long pants. Also, tread carefully for there are a lot of thorny bramble about and they will scratch and snag if you are not paying attention…trust us on this 🙂 Still, a trek is definitely worth it to see something that happens every year but isn’t around all year.